She needs her own cooking show ASAP. 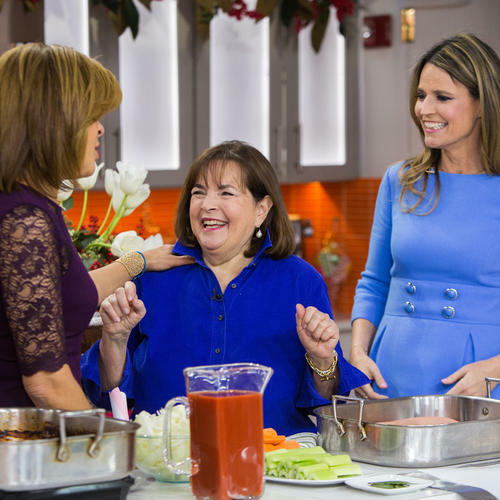 Actress Jennifer Garner, who is apparently a big fan of Ina Garten (and honestly who isn’t?) recently made her own version of an instructional baking video which she entitled “Pretend Cooking Show”—and it’s not only an adorable offering from a seemingly very relatable celebrity, it’s also actually full of useful baking tips. As you’re watching it, you’ll find yourself wishing it was the real thing. Plus, there isn't a single mention of Ben Affleck. In the video—which presumably takes place in Garner’s own home—the actress decides to whip up her so-called bread men using a recipe from Garten’s Barefoot Contessa at Home cookbook, a recipe she says consistently makes her family happy. Before closing the cookbook (which seems well-loved from the look of the Post-It notes marking different pages) she kisses the cover and whispers, “Love you Ina.” We can relate. The lesson here? Well, there are a few takeaways: Jennifer Garner seems like a lovely person, a good cook, a loving mom, and a charming television personality. Always trust Ina Garten to come up with simple but delicious recipes. And finally, your bread doesn’t have to be perfect. All you really need to make it good is someone out there who you care about and want to cook for—a heartwarming message for the holiday season.